Toronto, Canada — August 29th, 2016 — WaveDNA is proud to announce Liquid Music version 1.6.1. This latest version features Export MIDI: Drag’n’Drop for VST & AU. To commemorate the release Liquid Music is on sale for 50% off until August 31st, 2016. Easily export MIDI from Liquid Music VST and AU. Click on the Export MIDI button in the toolbar, and drag and drop into your DAW to create an exported clip with MIDI notes from Liquid Music. Alternatively, dragging and dropping from the button into Explorer / Finder will create a MIDI file at that location on your hard drive. The new button in the toolbar at the top of the Liquid Music arranger screen looks like a square with a ‘plus’ in the middle of it. Simply clicking and dragging this button into your DAW will instantly export all the notes in your Liquid Music arrangement, directly into your DAW’s project. You can also do the same drag and drop onto your computer’s desktop to export as a MIDI file. This workflow will boost the brainstorming and composition process when you use Liquid Music VST and AU. If you simply click on the Export MIDI Drag-n-Drop button, a pop-up menu appears with four options for customizing your MIDI export. 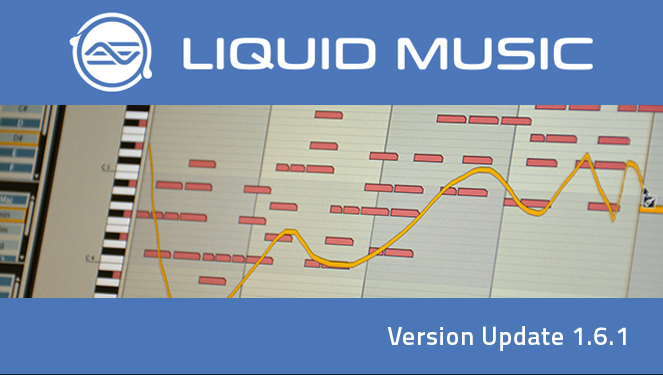 Also in Liquid Music 1.6.1 is a variety of workflow improvements and bug fixes, full details can be found here. WaveDNA WaveDNA is a Toronto, Canada based music software company founded in 2010. More than 15 years of research have been applied to designing and developing the next generation of MIDI software instruments Liquid Rhythm and Liquid Music.